I’ve had a few requests for updates on what’s going on with past Advocate & Pray kids. Tracking down how their stories have progressed can be difficult, but I did my best to do so with some of the kids. I may do another similar post in the future if you guys like this one. 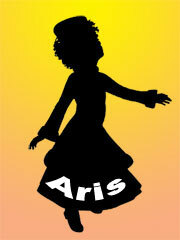 Aris (November 4, 2013) — Aris is no longer visible on the Children’s Hope International website. I emailed someone I had talked to previously and she said that not much is happening in Ethiopia. Several families are stuck in the adoption process, matched but unable to actually bring the children home. They aren’t sure they’ll be able to continue to Ethiopia program. Pray that Aris will be well cared for, whatever happens. Min Kyo (November 18, 2013) — Min Kyo is no longer listed with Heart Gallery, LA. I don’t know what that means, but hopefully it’s good news. Sunny (December 2, 2013) — I can’t even find the initial post that mentioned this young lady who was about to turn fourteen and become too old to be adopted from China. Vitalik (January 6, 2014) — In an update on March 3, 2015, I mentioned that a missionary in Ukraine let me know that a friends of her’s adopted Vitalik! You can pray that he is doing well with his new family. Greta (January 13, 2014) — On March 31, 2014, I posted to say Corine Lucas (one of our readers) posted on Facebook to let me know a family was seeking to adopt Greta. This family is still in process. Updates on the family’s blog are few and far between, but if you’d like to follow their journey, you can at Obedient 2 His Command. Angela (February 10, 2014) — Angela is no longer listed with Doorways to Hope. Candy (February 25, 2014) — Candy was another young lady about to age out of the adoptable age range in China. 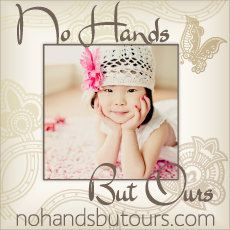 She was listed on Gladney’s, Asia Waiting Child blog. Beyond that initial blog post, I was unable to find further updates. Margaret (March 10, 2014) — Margaret was listed with the same agency as Aris, and is likewise no longer listed. Olexander (March 24, 2014) — Olexander is no longer listed with Doorways to Hope. Jacques (March 21, 2014) — Now eight years old, Jacques is still listed with AdoptUsKids and has a new profile picture. Olive (May 5, 2014) — The original post on No Hands But Ours is still available and her profile is still listed with Bringing Hope To Children. Zack (May 19, 2014) — When I clicked through to the No Hands but Ours post linked to on the TIO post, one bold printed line had been added to the top of the post. Update: My family has found me! 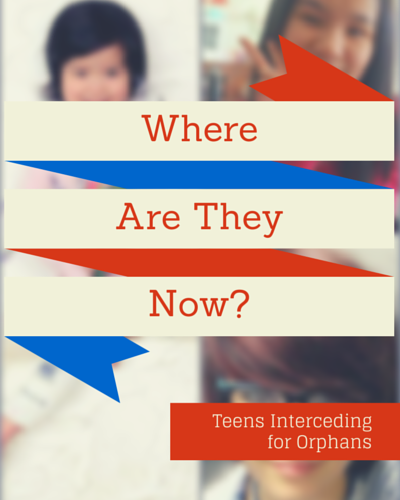 Did you like getting an update on the kids we’ve prayed for? Have you followed any of their stories more closely? 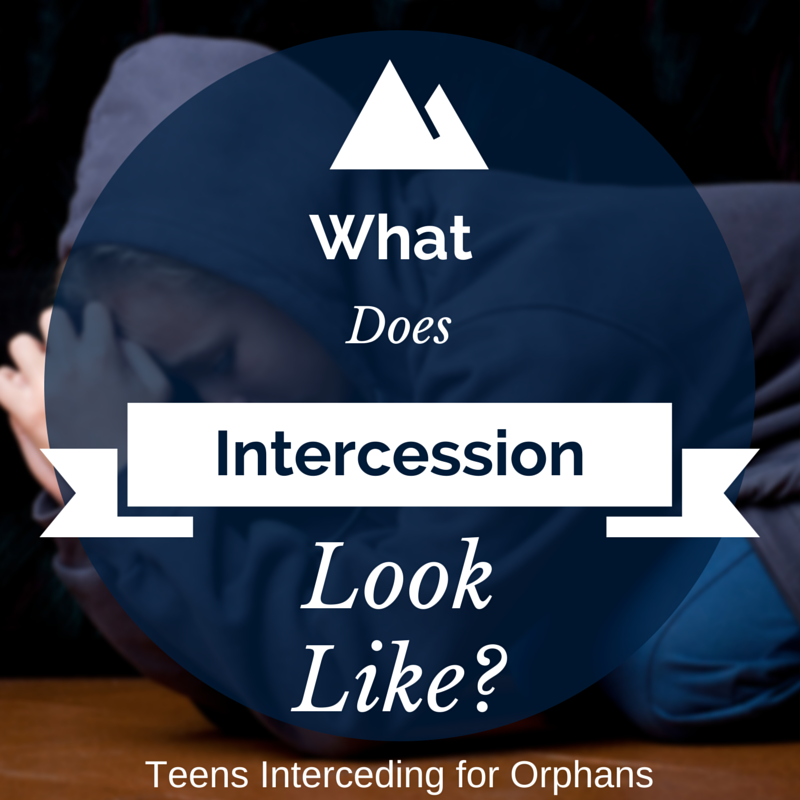 The title of this blog is Teens Interceding for Orphans, but what is intercession? Over the past month, several posts here on TIO have focused on the concept of prayer. One of the “visions” cast in the post, Renewing the Vision, was a dedication to praying for orphans, particularly those posted biweekly in the Advocate & Pray posts. We looked at how to use the prayer chains and how to use Scripture to pray for those we don’t know well. 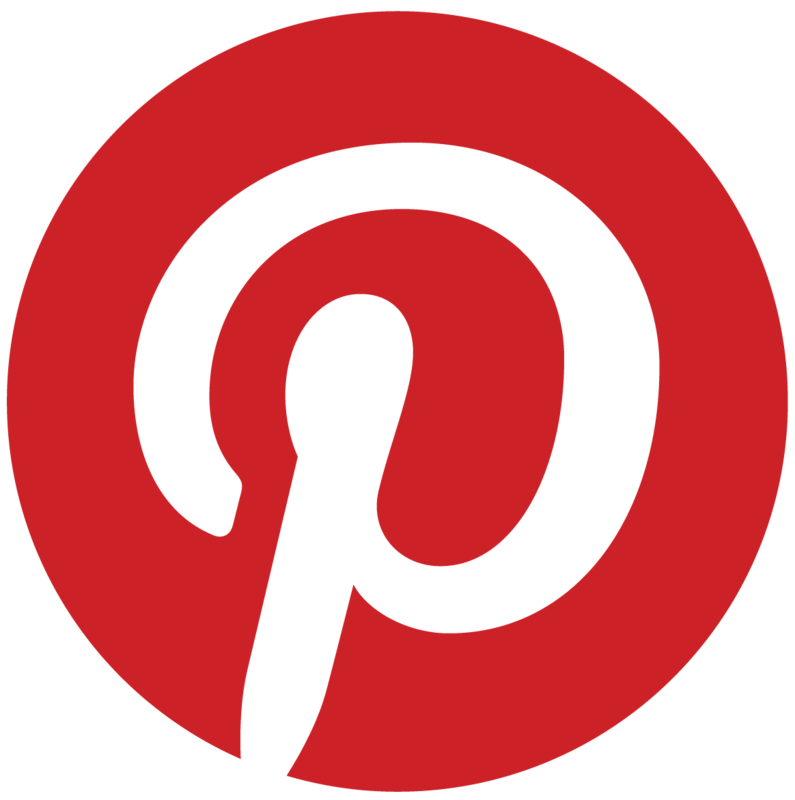 These posts have been practical, how-to type posts. This post is intended light a flame of enthusiasm for prayer. Prayer is something each and every one of us can be active in, but we need a vision for it or else it just won’t happen. Prayer is hard, and it can seem boring. We need determination and diligence in prayer. This sermon casts a vision for filling the gap by being willing to stay behind the scenes, on our knees, engaging in battle through prayer. If you don’t have time to sit in front of your computer and watch the message, you can download the mp3 to your mobile device and listen on the go. Will you be the man under the stage for orphans? Want to hear more of Mr. Ludy’s messages on prayer? There are lots of them! 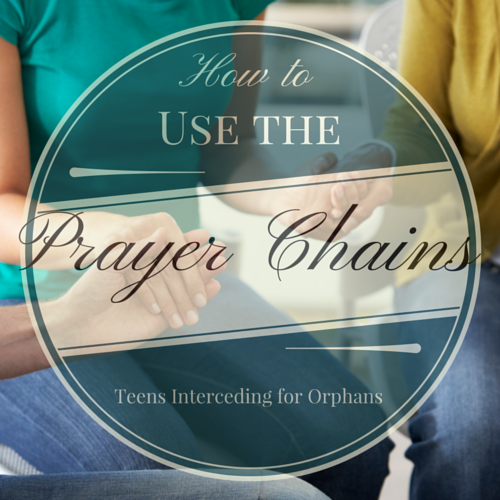 Two weeks ago, in the post How To Use the Prayer Chains, I told you to keep your eyes open for a post on how to pray for children you don’t know much about. This is the post. While spending time in the Scriptures, it is pretty easy to find prayers that have been made on behalf of others. I thought to use those requests and thoughtfully make them my own as I prayed for my brothers, my sisters, and even for those who are still in their sins. Now, an exhaustive Biblical study of that would require a much bigger “menu.” 🙂 [The pamphlet is titled “The Apostle’s Sandwiches” and is laid out like a restaurant menu.] What you have in your hands is the result of looking through Acts and the Epistles. Prayer Scripture is a wonderful way to keep our requests aligned with the heart and will of God. 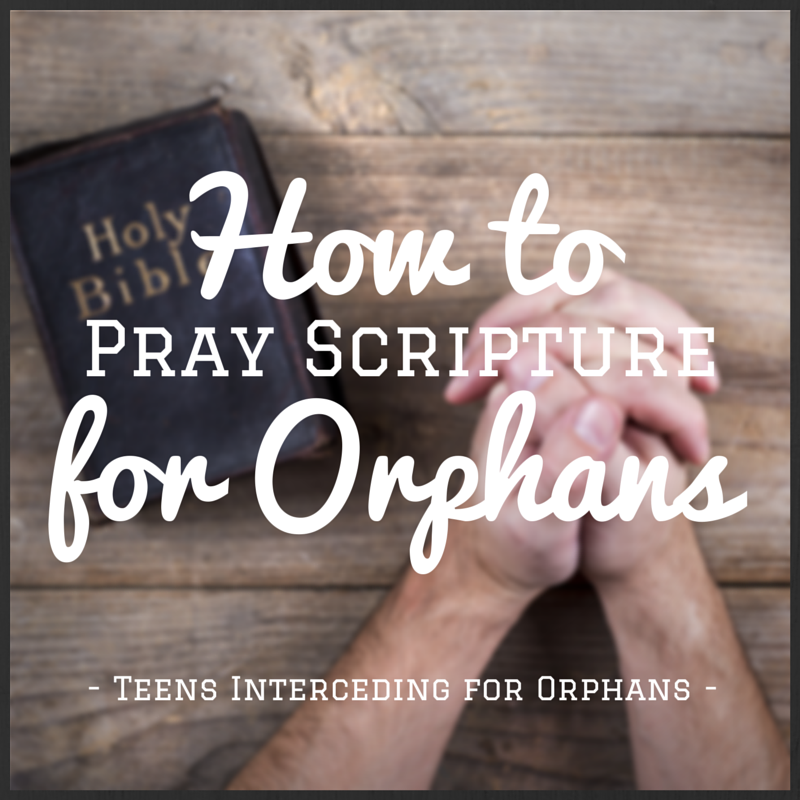 It also makes it much easier to find requests of substance to offer up on behalf of orphans and other individuals we do not know personally and don’t have a prayer requests list for. Here’s one prayer from “The Apostle’s Sandwiches” that you could pray for an Advocate & Pray child. Heavenly Father, I pray that _________ may prosper in all things and be in health. I pray that You would give Your mercy, Your peace, and Your grace. A concordance and/or Bible software will be great tools for praying Scripture for orphans. If you don’t have a Bible program on your computer, I would highly recommend The Word, which is free and has lots of fun study features. You can also get YouVersion if you want an app for your mobile device. My personal preference for praying Scripture is to spend some time finding appropriate Bible verses, usually four of them, and then writing them out before revising them into a prayer. Here’s a prayer I wrote out in my journal for Aris back in November of 2013. Lord, please provide a family for Aris. Prick the heart of a member of Your body to be Your hands and feet to her and to love her as You love her. Lord, please be ever constant in Aris’ life. Never leave or forsake her, but keep Your hand on her life. Lord, please bring Aris unto You. Let her come into Your arms. Place Your hand on her head and pray for her. Make her one of the children of the kingdom of heaven. Lord, with you all things are possible, even the adoption of a twelve year old girl who cannot see or hear. Please work this miracle for Aris. One of the challenging aspects of prayer is that we often can’t see how it’s working … or if it’s working at all. However, there’s no question that prayer is an essential Biblical principle, and something we can all do to involve ourselves in carrying for orphans. As you can see, the Bible provides plenty of verses you can employ in your prayers for the fatherless. No need to fall victim to “prayer’s block”! 😉 Finding those verses might take some practice, but I encourage you to give it a try! I think you’ll find it well worth the effort. Can you think of some verses you could pray for orphans? Share them in the comment section below! *If you would like a copy of “The Apostle’s Sandwiches,” let me know. Our friend has a note in the pamphlet inviting people to contact him to request copies. The Advocate & Pray posts on this blog are our most consistent and lasting feature. 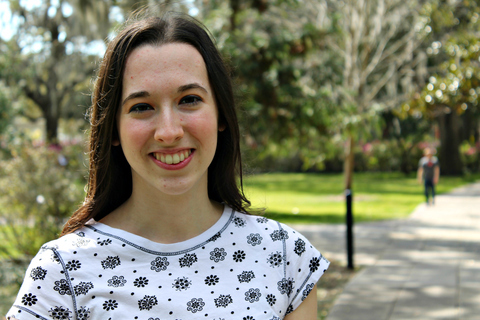 What kind of orphan care and adoption blog wouldn’t want to raise awareness for individual children in addition to discussing orphan care in more general terms? The very first post was about Aris, a deaf and mute little girl in Ethiopia. Of all the children shared, Aris is the one that rests most consistently on my heart and enters my prayers most frequently. Which brings me to the point of this post. Prayer. Prayer is a word that gets batted around a lot, but is rarely given the attention, focus, or esteem it should be. Because of that, I’ll be making several posts about prayer this month. One of the features of the bi-weekly Advocate & Pray posts is a prayer chain. The point of these is to wrap each particular child in daily prayer for the two weeks they are featured on the blog. Praying is an orphan care opportunity wide open to ever age group and demographic, and it’s one of the most important ministries you could apply yourself to. So how do the prayer chains work? Let me walk you through the process. Start the process by reading about her and learning as much as you can from the limited information available. For example, Felicia is learning to stand on her own, is only partially sponsored, and needs a wheelchair. These are all things you can pray for. Click on the prayer chain link. This will bring you to a spreadsheet divided into time slots. 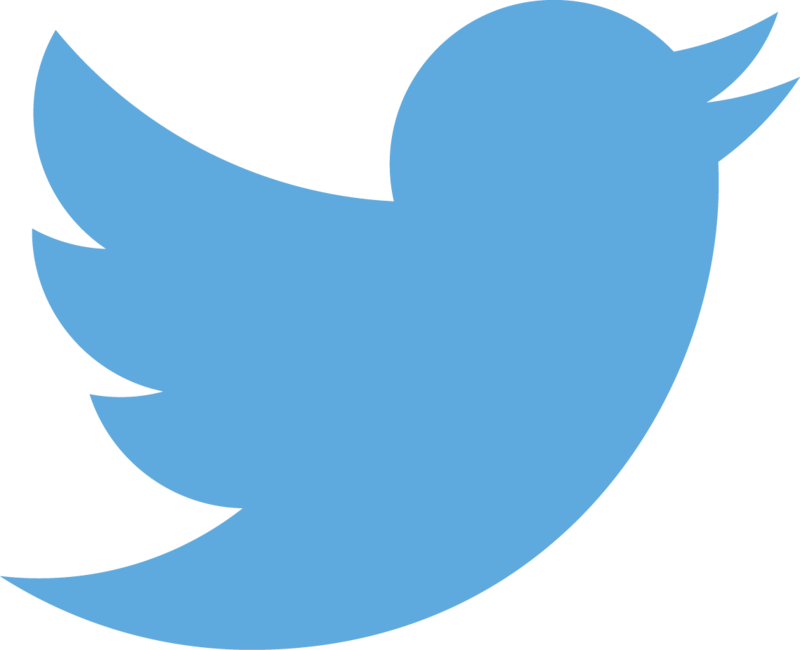 Right now each 24 hour day is divided into 15 minute segments. 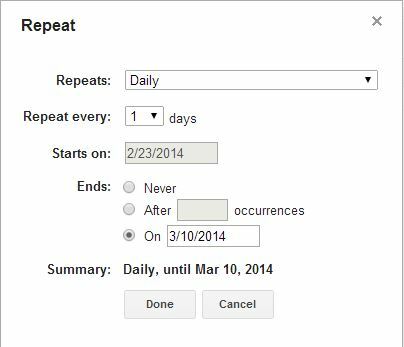 Starting next week, we plan to reduce it to hour long segments to make the spreadsheet cleaner and less overwhelming. Pray! Be diligent to pray for that child every day during your time slot for the period of time you signed up for. Keep your eyes open for another post offering ideas on how to pray for someone you know so little about. BONUS POINTS: Ask your friends and church to pray for the Advocate & Pray children too. Do you have any questions about how this is supposed to work? Any suggestions for making it better? If you’ve been around TIO for any length of time, you’re probably familiar with our Advocate & Pray posts. Every two weeks, we post about a child who is waiting to be adopted and ask readers to pray and advocate for that child. To help motivate everyone to actually pray, we put together a prayer chain. Right now we’re praying for a sweet girl named Candy (no pun intended). The prayer chain gives you an opportunity to sign up to pray for the child during a 15 minute slot of your choice and then pray daily for the child during that time for the next two weeks. Now, if you’re like me, you probably start a prayer chain with great intentions and an eye on the clock. But as time passes, it might get harder to remember. That’s where Google Calendar comes in. 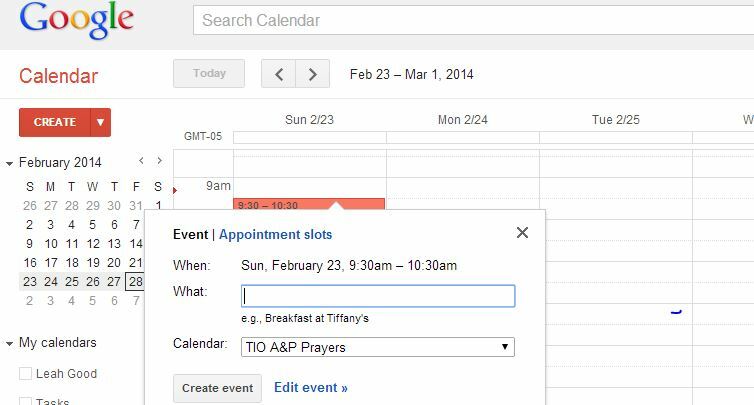 Google Calendar allows you to schedule events and ask for email reminders. I’ve found it to be a great tool to prompt me to pray. Here’s how you do it. Start by figuring out how to get your calendar. If you have a gmail account, that’s as simple as clicking the link. 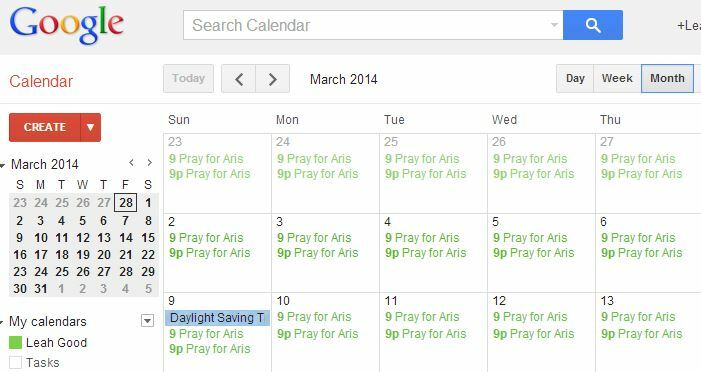 If you don’t have a gmail account, you probably have to sign up for one to use the calendar. It’s free. After you sign in, it usually gives you a blank calendar to work with. If it doesn’t, go to the left side-bar, find “My Calendars”, click the arrow to the right of those words, and chose to create a new calendar. After you create it the program prompts you to name it, etc. etc. Fill out whatever you want, then scroll to the bottom of the page and click “create calendar”. Now you have a blank calendar! Set it to show you a week at a time, then find the hour you’re supposed to pray in. Tap that time slot and it’ll pop up a box asking you to create an event. Click “edit event”. Next you’ll want to title your prayer time and adjust the time to your appropriate time slot. When I sign up I usually take the 9:00 to 9:15 spot so you’ll see those times in the box for the example. You don’t want this reminder to be a one-day deal, so check the “repeat” box and fill the boxes in. The “event” will start on the day you click on the calendar. Set it to repeat daily and end whenever you want it to…usually two weeks after the A&P post. Click done when you have it just the way you want it. Finally, scroll down a little further and make sure you add a reminder. The pop-up reminder only works if you have Google Calendar pulled up all the time, so I use the email reminder. I set mine to remind me one minute before my time slot starts, but you can set yours to whatever works for you (obviously). 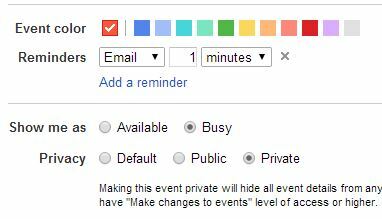 I also set the event to private on the very bottom. It’s not a big deal if someone else sees, but privacy seems like a good thing to me. When you’re done, scroll to the top of the page and click “Save”! If all goes well, you should get an email like this one reminding you to pray. Have any questions or suggestions? How do you remember to pray?